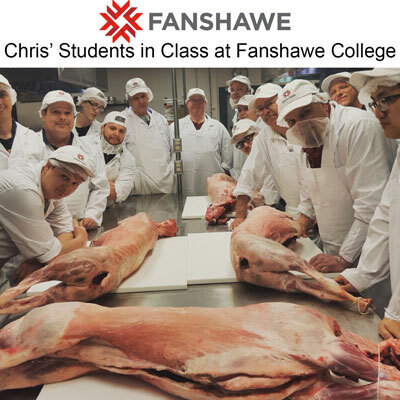 Chris teaches at Fanshawe College in London Ontario in the highly sought-after and specialized trade of meat-cutting. Fanshawe College's Retail Meat Cutter Pre-Apprentice program prepares students for work in Canada's growing meat-cutting industry. Through a combination of practical "hands-on" learning labs, theory classes and work terms, Chris teaches his students how to build skills in meat processing, product packaging, professional safety standards and work practices. Chris teaches his students trade readiness, value-added skills training, academic upgrading, job search techniques and Chris’ students build skills in meat processing, product packaging, professional safety standards and work practices. 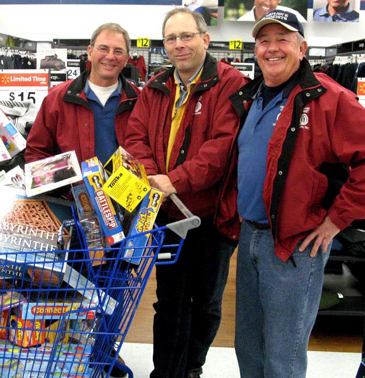 with Frank and Basil, whom are also Fanshawe Optimists. - When Chris isn’t volunteering in the community on various projects etc, or in the butcher shop, you will find him enjoying his other passions, his family, his grandkids, traveling, golf, and all things football ! Proud to be seller for Forest City Cookbook! All books are sold out of our location.